I happened to this region and it was surprisingly interesting. Photos from 01-03.08.18. Such a nice view but sad that the wooden house is derelict. Very interesting although I don't like such modern additions in general. 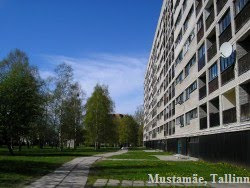 These blocks appear in my earlier post about Pärnu from 2008.